A few weeks ago, Shaelani was able to go to a very special Birthday party for her buddy Ruby, with some of her best ever R friends. She did great on her first ever sleep over away from home. She also came home with a new American Gir* doll. That has been a very popular toy around here, and Emily immediately asked for one. I went on line to get her one for Christmas, thinking I could wait a few months to give it to her. I was so excited to find a gymnast named Ivy. I thought it was perfect, especially since Emily has a special connection to a real life Ivy that we all love very much. Clearly, I couldn't wait till Christmas to give Emily her doll. Here they are, Ivy and Megan. Emily and Shaelee both worked on some lovely artwork. And they just had so much fun being little girls and playing with their new dolls. They were just a joy to watch, and they will only be little for such a short time. I just enjoyed the weekend watching the littlest sisters play and play and play. I did smile when Emily commented, that now we have an Ivy too. Just noticed the new pictures. 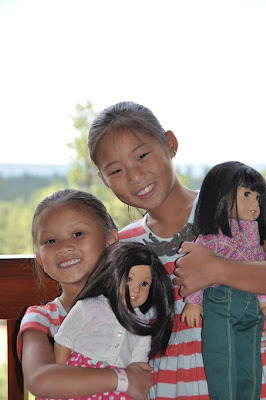 Who are those pretty girls with their Americal Girl dolls?? I believe they are my wonderful grand daughters. So sweet.